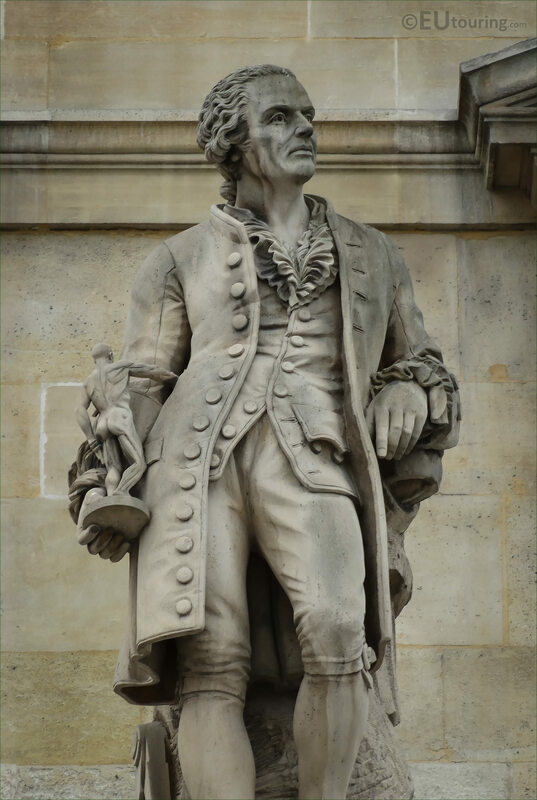 Again we were looking at the same wing of the Musee du Louvre, which is called the Aile Daru, when we took these high definition photos of a statue dedicated to Jean-Antoine Houdon, and this was produced by the famous French sculptor Francois Rude. 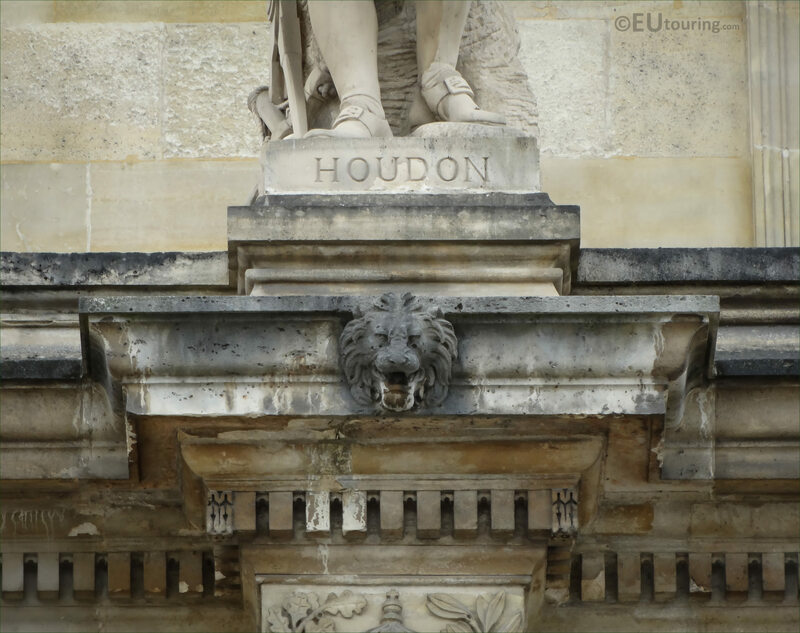 So in this first image you can see the stone statue of Jean-Antoine Houdon located in between the windows of the first level balustrade on the facade of the Aile Daru, which can be seen from the Cour Napoleon in the 1st Arrondissement in Paris, and is positioned fourth from the right hand side of this wing of the Palais du Louvre. Now this stone statue was produced by Francois Rude, who was born in 1784 and went from Dijon to Paris to continue his studies of art, becoming a renowned French sculptor, with his most famous sculpture being the statue group called Depart des Volontaires de 1792, also known as La Marseillaise, which is located on the Arc de Triomphe, yet he also had many other public commissions including one for this statue of Houdon. 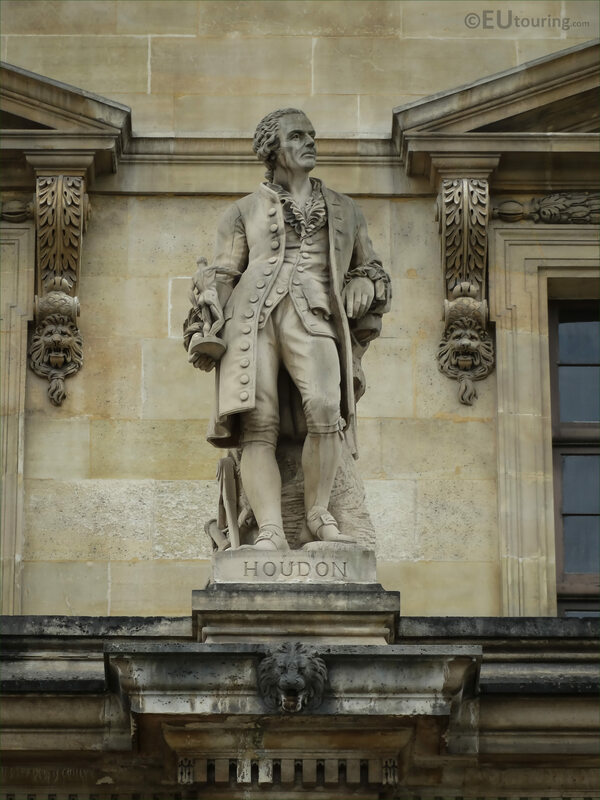 And Jean Antoine Houdon, which is the surname you can see on the plaque at the base of the statue, was also a renowned sculptor being able to capture a person's personality as well as their looks, and he produced numerous bust statues of famous people including Voltaire, King Louis XVI, Napoleon Bonaparte and was even requested to travel to America to produce a statue bust of George Washington, after having sculpted a bust of Benjamin Franklin.